276 pages | 73 B/W Illus. 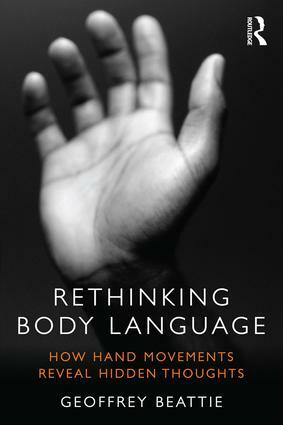 Challenging all of our old assumptions about the subject, Rethinking Body Language builds on the most recent cutting-edge research to offer a new theoretical perspective on this subject that will transform the way we look at other people. In contrast to the traditional view that body language is primarily concerned with the expression of emotions and the negotiation of social relationships, author Geoff Beattie argues instead that gestures reflect aspects of our thinking but in a different way to verbal language. Critically, the spontaneous hand movements that people make when they talk often communicate a good deal more than they intend. Geoffrey Beattie is Professor of Psychology at Edge Hill University. He is the author of 20 books and over 100 journal articles, and was awarded the Spearman Medal by the BPS in recognition of outstanding published work in psychology. He has presented a number of television programmes and was also the resident on-screen psychologist for 11 series of Big Brother, specialising in body language and social behaviour.